Gwynnie Bee is a clothing rental subscription service for women sizes 10-32. I have been having a lot of fun with this subscription! Did you know you it’s totally FREE to try Gwynnie Bee? 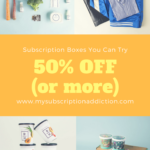 Try it here, and don’t forget to check out all of the other subscription boxes you can try for free! Coupon: Get your first month of Gwynnie Bee free with this link! I got so many compliments on this sweater! I think the lacing on the front is such a fun and stylish detail, but the real show stopper here is the color variation in the acrylic-blend knit. It is so gorgeous, and pictures just don’t do it justice! From a distance, it looks like a lavender sweater, but up close you can see the various threads of white, pink, and blue. It’s so pretty! I didn’t end up wearing this corduroy jacket out anywhere. It is a cool color and very stylish, but it was kind of stiff and thick. I just wasn’t comfortable in it. It was a great length for me, though. I was so disappointed! I used to have a sweater almost exactly like this acrylic blend one when I was a teenager, so I loved this one! The thick knit embroidery on the arms is so beautiful! And so unusual! It was also very warm and cozy. I actually got some compliments on this polyester dress as well, which was surprising to me. It initially didn’t look great on me, but with the right undergarments, it looked good. The sleeves are just so cute and stylish for the end of winter! I didn’t wear this dress out anywhere either, unfortunately. I didn’t love the knit raglan sleeves on the synthetic blend body, but that wasn’t the main problem. I was super excited to try eShakti when Gwynnie Bee first started carrying that brand, but I feel like something about the construction of the clothing is off. This material was too stiff, for example. I am not sure why, but everything has sort of a handmade feel to it. What a cute top! I felt great in this top, and I thought it looked pretty good on me. I love the style! It reminds me of Lucky Brand, but the material is a little different. It’s a non-stretchy polyester blend. I would have preferred a more open neckline, but otherwise, this poly/spandex dress was just adorable for the end of winter/beginning of spring transition. The print is just gorgeous, and the colors too. It is also very comfortable, as are most dresses from London Times. Perhaps because they are unlined? This cotton knit blend cardigan was super soft and cozy and warm! I didn’t feel especially cute wearing it, but when I look at the pictures it was one of the more flattering pieces this month. It gave me sort of an urban feel. I like it! This gorgeous polyester dress from Ralph Lauren was my absolute favorite piece this month. I just love it! It is very comfortable and super flattering. I also really love the print and the colors! Purple is my favorite color, and it is just so tastefully done here. The Verdict: I love Gwynnie Bee! This month there were a couple of misses, but I had a good turn-around rate. I was still able to wear lots of beautiful pieces that I enjoyed. My favorite was the Lauren dress! So pretty! I love having the opportunity to try lots of different looks, especially some that are outside of my usual style. This was another awesome month! Check out all our Gwynnie Bee reviews and the best women’s clothing subscription boxes of 2019!